My first serious camera was the Zeiss-Ikon Supercontaflex, a hand-me-down from my father. I had an Agfa rangefinder before the Zeiss that I had to use a separate light-meter and telemeter. I can no longer remember what it looked like. I had Super-Contaflex model, but same looks as the picture, though. It was a consumer grade camera that competed very successfully against the very expensive Leica M2 and M3. 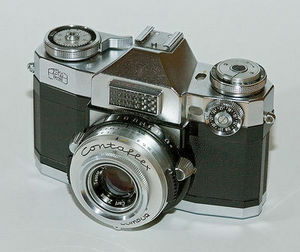 The Contaflex was a very interesting camera and I believe the first of its kind. It was an SLR, with a leaf shutter, and without an up-and-down or rapid return mirror. Therefore, only the front element could be interchanged. The advantages were a smaller and quieter SLR. The main disadvantage was that the lenses focal length ranged from 35mm - 115mm. The Zeiss Tessar 50mm f/2.8 was a very sharp lens. I used to blow the slides up on a massive screen and they never lost resolution. On the other hand, when I "upgraded" to the Canon A1 and AE1 system, in the mid 70's, the photos taken with the Canon 50mm f/1.4 , projected on the same screen, lost resolution, they were not as sharp, and the color rendition was not the same. I really do not know why anyone but me is interested in reading my blog, on a regular basis, because it is a very self-centered collection of ramblings. I think of it as my "Electronic Diary." In addition, I do not believe that I'm qualified enough to present meaningful and objective reviews. The real purpose for my blog existence is twofold. Firstly, I use it as my home page. I have all my links that I can access from my main computer, Netbook, or any other computer away from home. Lastly, it is the place I write articles or explanations of what I do and the reasons for it. I always refer to my blog's articles when I participate in the different forums. In this way, I only have to write it once and above all, I will not go off-topic in the other forums.